There are many processes inside the warehouse that can be performed more efficiently with the implementation of Voice-Directed Distribution®. Vocollect offers a variety of commercial, off-the-shelf applications to add voice to order selection, replenishments, put-aways, transfers and receiving. Click on the videos tab to see examples of voice at work in each of the areas in the diagram below. RF handhelds are among the many platform choices you have for directing work in your distribution centers. Adding voice to your handhelds offers options for making your team more efficient and extending performance. But deciding on the best fit for your business can be challenging.You need to weigh the cost/benefit and performance tradeoffs between using voice-only wearable computers and voice-enabled handheld devices. For 20 years, companies l ike yours have turned to Vocollect to more effectively direct work in industrial environments to increase accuracy, boost productivity and reduce operating costs. Up until now, Vocollect’s “Gold Standard” industrial speech recognition technology was available only on Talkman® wearable computers. No longer. Now you can combine the performance of Vocollect Voice with handhelds if that’s the best decision for your business. Extend Voice-Directed Distribution® beyond intensive, full-time use to other applications where voice adds value. Now the same people who perform multiple operations can use screen displays for some applications, and add voice for others – choosing the right tool for the job. Enhance performance from receiving/loading to dock operations by combining voice into handheld applications. Combine full-time voice-only users and voice-enabled handheld users operating seamlessly under one roof. They will use a single WMS connection, a single user and device management console; and the same standard applications – all the way down to the voice prompts. Fast, accurate, and noise tolerant. That’s what has made Vocollect Voice the most accepted voice technology in the world.You will take advantage of 20 years of experience of working with your peers to become the industry standard for Voice-Directed Distribution in demanding industrial environments. Industrial-grade Speech Recognition headsets. In a noisy DC, headsets that cancel out background noise are absolutely essential. The SR-Series is available with either a consumergrade audio jack or with Vocollect’s patented industrial-grade breakaway connector, which attaches to the Symbol MC9060 via an adapter. Runs standard applications. Now you can add standard, off the shelf voice-enabled applications for selection (piece & case picking), put away, replenishment, and inventory moves. Flexible and scalable. Text-to-speech capability translates any data to speech. 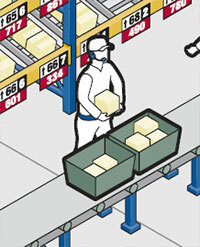 So if you add new SKUs, information like descriptions will be immediately accessible to workers. And if you need to add or edit dialogs, any text you enter is automatically converted to speech. Open & easy to support. Standard Microsoft® Windows® CE operating platform enables integration with common RF handhelds supporting Vocollect Voice. Friendly for workers. Workers can respond in any language, choose to hear a male or female voice; and select from 9 different speeds for their prompts (up to 400 words per minute). Add voice to handhelds easily. Team members can add highly accurate, personalized voice to their RF handhelds in 30 minutes or less anywhere in the DC and realize incremental improvements in productivity in a matter of hours. Total solution. Since driving real results takes more than just hardware and software, you can tap into a vast team of experts to evaluate your operations, build a business case, manage change, design and implement on-time and on budget; coordinate training; and provide ongoing 24/7 support to your DC team. VoiceLink 3.0 is the first software application in the voice industry that leverages leading-edge open source technology – the Vocollect Voice® Integration Platform – and combines it with Vocollect’s industry-leading voice applications to drive process improvements for both Operations and IT. This new platform allows Vocollect Voice applications to fit easily and cleanly within an enterprise-wide IT strategy. The results are lower integration costs, improved configurability and eased ongoing maintenance and upgrades. VoiceLink 3.0 comes with over 400,000 selectable, fully tested configuration options that deliver immediate savings for DC operations and meet the toughest enterprise IT requirements, both today and tomorrow. Future Vocollect applications will be built on the Vocollect Voice Integration Platform for faster time to market, lower training costs and better integration with enterprise IT environments. Deployment management tools help you to manage the wearable hardware and other devices that your DC team needs to make Voice-Directed Distribution® a reality. Vocollect VoiceConsole® gives you the visibility you need to manage your operators and devices. Details like device IP address, voice templates, and the voice applications loaded on each of your voice-enabled devices are controlled from an easy-to-use Web browser environment. Vocollect Voice® for Handhelds gives you the opportunity to extend Voice-Directed Distribution® beyond intensive, full-time use to other applications where voice adds value. Now the same people who perform multiple operations can use screen displays for some applications, and add voice for others—choosing the right tool for the job. Vocollect Voice for Handhelds also gives you the option of having full-time voice-only users and voice-enabled handheld users operating seamlessly under one roof using a single WMS connection, a single user and device management console, and the same standard applications—all the way down to the voice prompts.